Those responsible for the SSPA (Network of Sparsely Populated Areas of Southern Europe) have delivered to the Government Commissioner of the Demographic Challenge, Edelmira Barreira, a position paper that contains well-defined strategic lines whose application will allow the process of depopulation to be reversed. affects rural Spain. The document, in which the SSPA has been working for more than a year, is based on the premise that low population density is the most evident symptom of the real problem suffered by an important part of our rural environment in the form of a prolonged structural crisis for decades, which threatens to render the territory unviable in social, economic and demographic terms. To reverse this situation and stop the imbalance between the rural and urban areas, the work advocates the reformulation of policies of territorial re-territorial cohesion, since they have proved ineffective for their purpose, redefining even the concept of depopulated or rural areas, introducing changes in the distribution of funds and creating a territorial development agency that manages and monitors all actions. The SSPA is committed in this work to a model of rural development that covers all the sectors integrally and not with fragmented policies, for which it proposes and develops a series of strategic lines that cover the institutional and financing scope, the re-equilibrium, the cohesion territorial and taxation, economy, business and employment, infrastructure or education, identity and culture. This position paper states that not all measures require a budget, but also a willingness to cooperate between Public Administrations and social and economic actors to analyze the problem, propose solutions and carry them out, as the Scottish case shows, whose success story It has been presented by the SSPA throughout this last year. In the meeting, which took place in Madrid, the commissioner of the Government against the Demographic Challenge, Edelmira Barreira, has highlighted the coincidence in the purpose of dealing with depopulation and has valued the involvement of the SSPA Network in this task. He also shared the importance of boosting economic activity as a factor against depopulation, as pointed out in the document of the SSPA, betting on administrative simplification or the proposal of additional incentives, such as the doubling of the flat rate of entrepreneurs in municipalities of scarce population, included already in the project of General Budgets of the State. Along with this, it has also agreed that, as the Network proposes, it is a priority objective to equalize opportunities, connectivity and Internet access, which is why the Government of Spain has prioritized the implementation of the “Plan 300 × 100”, for the connection with fiber optic networks of 300Mbits/s all the population centers of Spain. In addition to reviewing the measures against depopulation that have been prioritized and implemented by the Government of Spain, the commissioner and representatives of SSPA have shared the need to continue working to transmit a positive image of the rural environment, capable of putting in value its advantages and virtues, and contribute to the fixation and attraction of population. The commissioner, in addition, thanked the work of the SSPA Network, which has been maintaining a constant dialogue, which both parties consider positive and fruitful. The SSPA will present this position document officially in the next few days in the three autonomous communities that make up the Network of Sparsely Populated Areas of Southern Europe, Aragón, Castilla-La Mancha and Castilla y León. The Network of Sparsely Populated Areas of Southern Europe (in English Southern Sparsely Populated Areas, SSPA) is an inclusive organization that aims to achieve legislative and political measures in Spain and Europe in the next programming period of 2020, aimed at reversing the process of depopulation and its consequences. The SSPA unites the five southern European provinces recognized by the European Union for having a population density of less than 12.5 inhabitants / km2, which are found in Spain, Croatia and Greece. 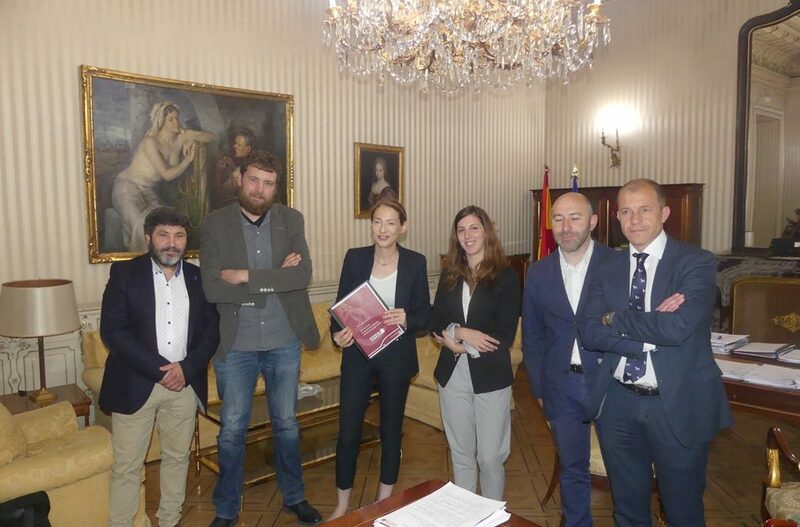 The network, founded in 2016, is formed by the business confederations of Cuenca, Soria and Teruel, the local action groups of the three Spanish provinces, the Lika-Senj County Development Agency (Croatia), their local action group and the Regional Government of Evritania (Greece).